Sprouted Moong Bhel is healthier version of chat. Sprouted Moong Bhel snack is very easy and quick to make. Sprouted Moong Bhel is a kind of bhel with a spicy tangy touch. Sprouted Moong Bhel is an excellent snack for kids and adults too. This tasty Sprouted Moong Bhel gives enough energy and stamina to race through the rest of the day! This wonderful snack made of sprouted moong, tossed together with chopped tomatoes, onions, etc., and a sprinkling of masalas too. 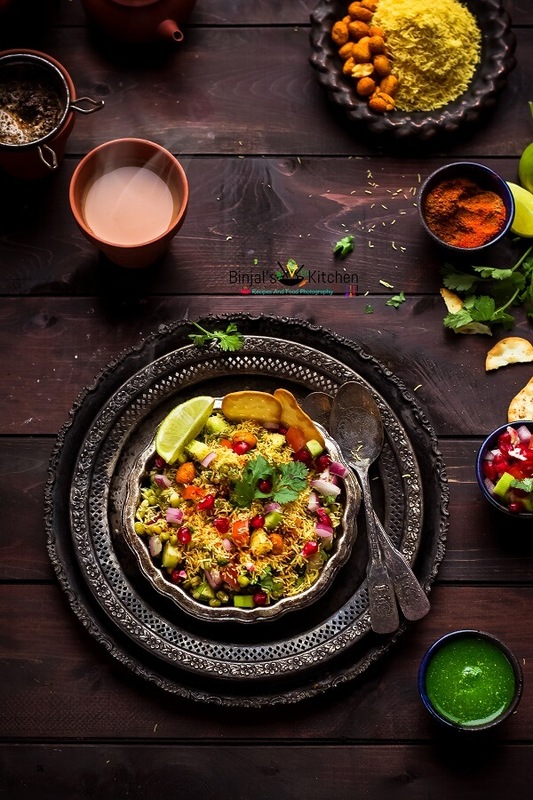 Bhel is one of the most popular Indian street snack, however originally bhel is made by puffed rice with some chopped veggie like onion, tomato and garnished with some chaat masalas. But sprouted moong bhel is a unique combination of bhel for healthier version. Now wonder how to make this? Here is the recipe… I am sure you will love it. And belive it is one of the best option for kids after coming from the school. 1. Boil the sprouted moong beans for 3-4 minutes with little salt and 1 cup of water then strain it and keep aside to cool down. 2. Remove the skin of boiled potato and cut into small-small cubes and keep aside. 3. Take a mixing bowl. Add the boiled sprouted moong beans, cubed potato, chopped onion, tomato, cucumber and lemon juice. 4. Now add green chutney and tamarind chutney as per your taste and mix it well. 5. Just before serving add fried masala peanuts, chopped coriander leaves, sprinkle some chaat masala, red chili powder, salt and mix it gently. 6. Healthy Sprouted Moong Bhel is ready for serving. You can garnish it with sev and pomegranate arils and serve immediately. • You can skip the boiling part of moong beans for more healthier option. • You can add puffed rice if you like it. Boil the sprouted moong beans for 3-4 minutes with little salt and 1 cup of water then strain it and keep aside to cool down. Remove the skin of boiled potato and cut into small-small cubes and keep aside. Take a mixing bowl. Add the boiled sprouted moong beans, cubed potato, chopped onion, tomato, cucumber and lemon juice. Now add green chutney and tamarind chutney as per your taste and mix it well. Just before serving add fried masala peanuts, chopped coriander leaves, sprinkle some chaat masala, red chili powder, salt and mix it gently. Healthy Sprouted Moong Bhel is ready for serving. You can garnish it with sev and pomegranate arils and serve immediately.